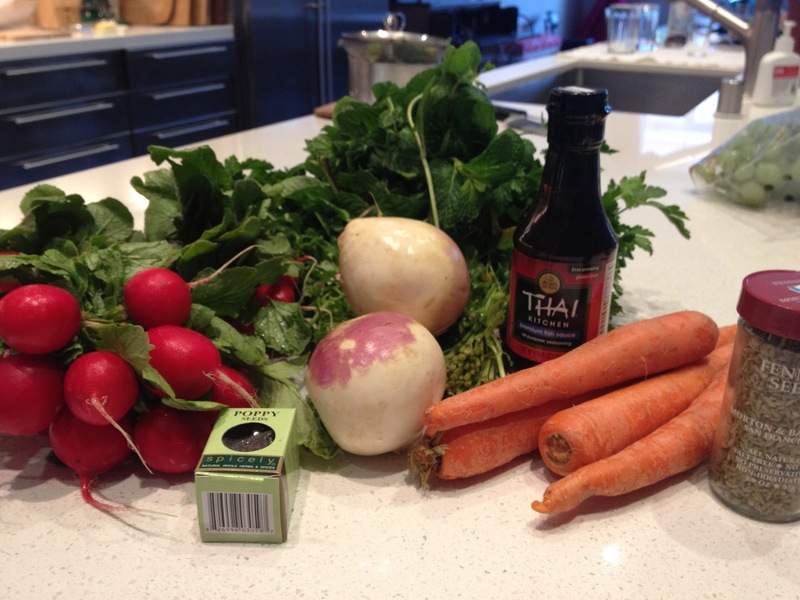 The main ingredients. I forgot to get a chili pepper, and I had to use turnips as a substitute for kohlrabi because they didn't have any at my regular veggie store. Apparently the texture and earthiness of raw turnips are a close match to kohlrabi, which I wouldn't know because I've never had it before. 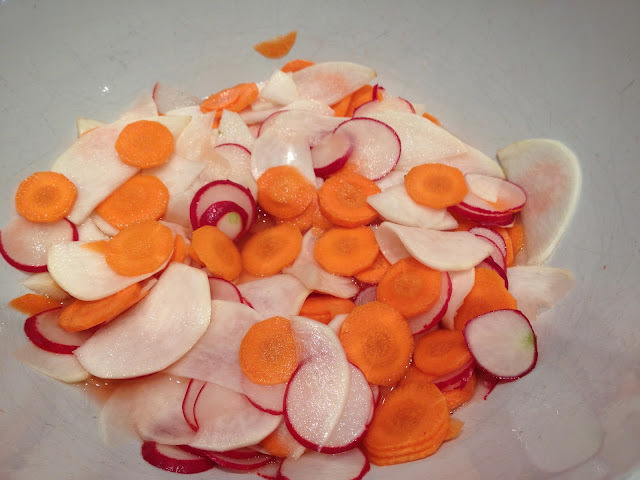 Slice the radishes, carrots and turnip into slivers. 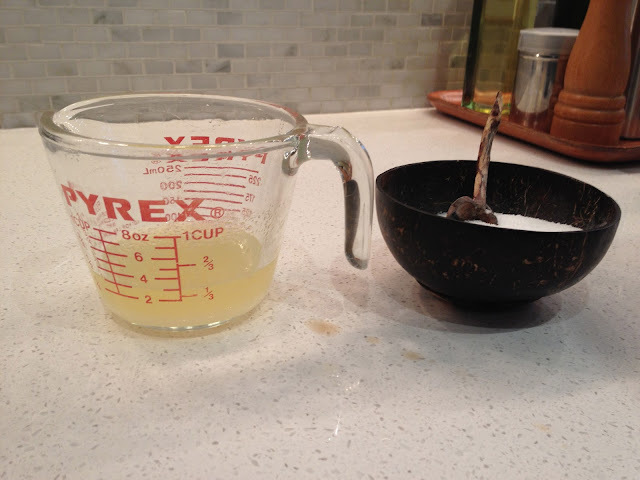 Mix together white wine vinegar, sugar and salt. I didn't have WW vinegar so I used fresh lemon juice instead. 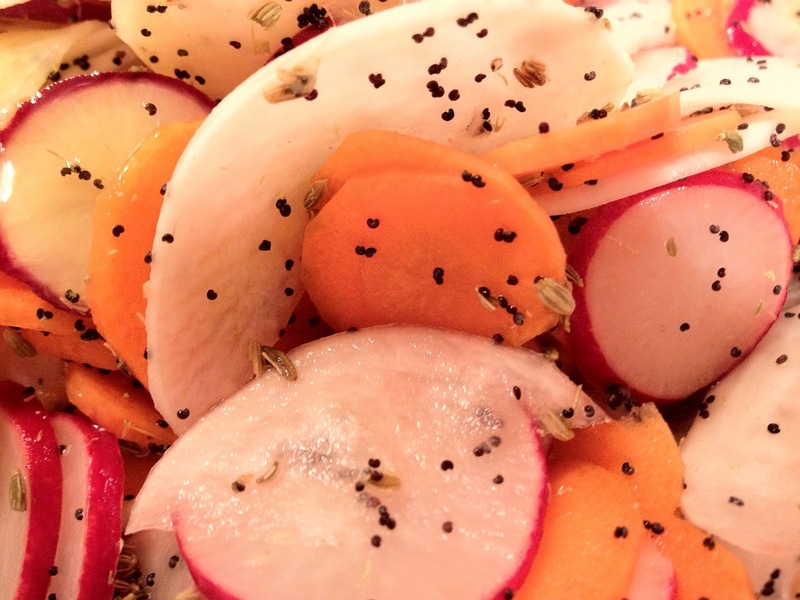 Pour over sliced vegetables and let them sit for one half hour. This tasted like a coleslaw at this point (kind of). Toast some fennel seeds and partially crush them. Drain juice from vegetables. 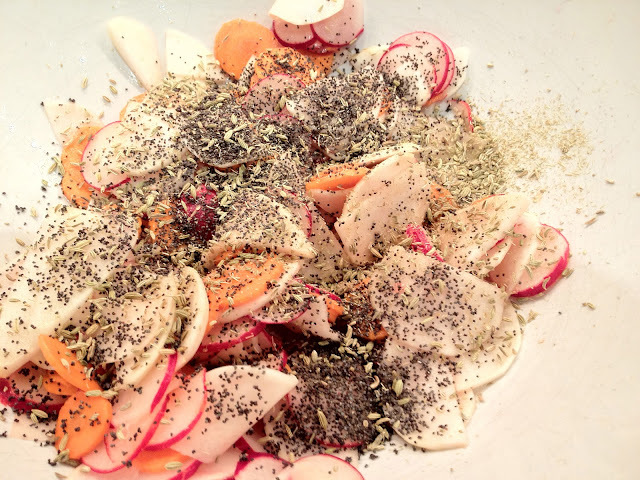 Add fennel seed, poppy seeds, lime juice and oil. 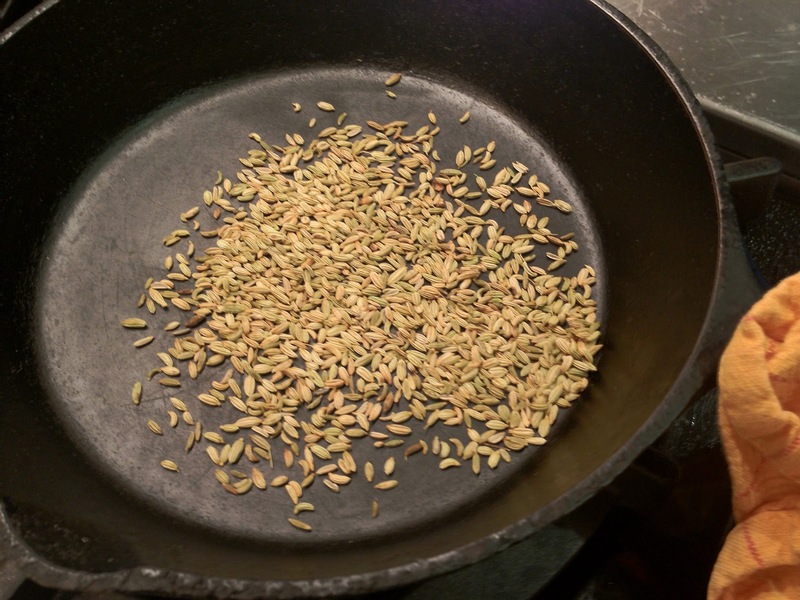 This recipe called for a weird oil that I'd never heard of before (groundnut) so I used olive oil instead. I also left out the fish sauce at this point (after having tasted it), I guess making this dish vegan! Mix everything together with hands. 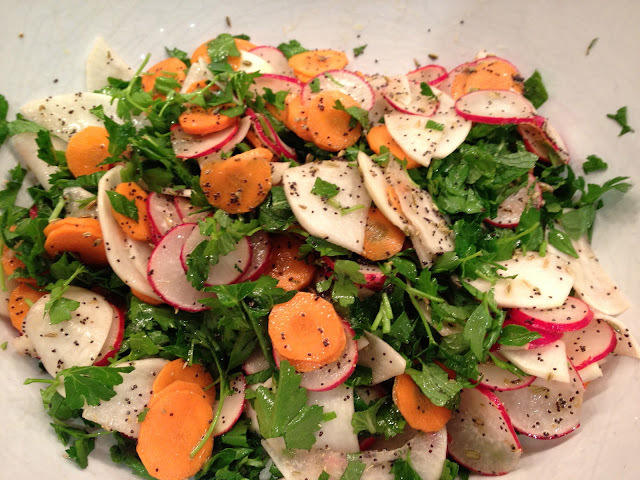 Transfer everything into a bowl of chopped italian parsley and mint -roughly a 2 to 1 ratio (parsley to mint). Here I used way more greens than the recipe calls for because we like greens in this house. Toss and serve. 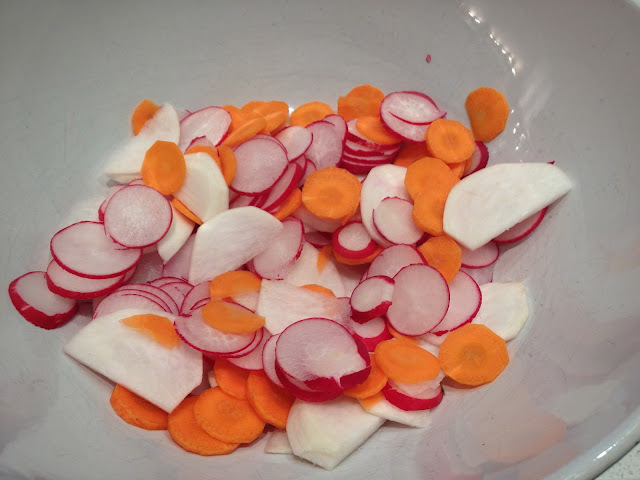 I hate to finish this post with this terrible photo but I wanted to show what we ate with this salad. Left over roasted chicken and garlic bread. Hopefully this raw salad makes up for all that butter in the garlic bread! you can find me at Laetitia Phelps ( St albans ) on facebook ...i have my pics of my food in there ...if you send a friend request i will accept :) Watermelon & Feta is somewhere in there as well. I'm one of the few in this world who's not a facebooker Do you instagram?.